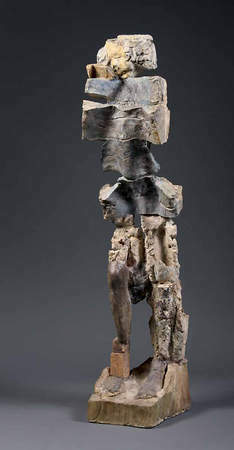 The exhibition Matter + Spirit: The Sculpture of Stephen De Staebler is on view at the de Young Museum through May 13. Stephen De Staebler’s widow, the artist Danae Mattes, worked closely with the Museums on this exhibition and its accompanying catalogue. She shares with the Museums’ managing editor of publications, Leslie Dutcher, some of her impressions of Stephen De Staebler’s work and her collaboration with him. Leslie Dutcher: In the exhibition catalogue, you are cited in an eloquent extract about Stephen De Staebler’s late “assembled” works in Rick Newby’s biographical essay. These later pieces are composed of fragments from Stephen’s earlier works and so they feel autobiographical, even diarylike, and, in your words, “an archaeological excavation, recollection and culmination of Stephen’s life’s endeavors.” I would love to hear more of your thoughts about these works, of this process, which you were able to witness firsthand. Danae Mattes: I would like to begin by describing the “boneyard” as I first came to know it. At the time we were married (1997) there was an enormous loquat tree that umbrellaed the boneyard on the southern side of the studio. To stand in the boneyard, one had to enter under its canopy, which was perhaps 25 feet in circumference. It was a magical place. On sunny days, green and golden shafts of light fell in shifting patterns to the rising slope of earth below. When there was fog, the soft misty penumbra was a mantle of quiet tones. Periodically throughout the day there was a riot of squirrel chatter and nesting birds. Here was an unusual compost; fallen leaves and fruit from the present and past mixed with ivy growth over mounds and gullies of sculpture fragments. Arms, legs, feet, wings, torsos and abstract forms could be seen in varying degrees. Such interesting sediment! Since 1976 organic and inorganic material built upon one another. By the time Stephen began foraging in the boneyard in 2006, the clay fragments were part of a very fecund and layered soil. Many of the sections found in the new work contain physical imprints of the time spent underground—soil and plant stains, even delicate patterns made by roots, have etched their ephemeral presence into the surfaces. In early 2001 the aged tree began to fail and as often happens, it had one last magnificent outburst of blossom into fruit, such as we had never seen before. In some beautiful and unerring way, both artist and tree made one last glorious and powerful yield. To witness Stephen innovate at that time in his life was a profound experience for me, though never without the attending presence of imminent loss. Most of the forms for Stephen’s last group of clay sculptures were extracted from the boneyard. Much like veins of ore in a mineral rich landscape, fragments of all varieties were dug out of the ground. 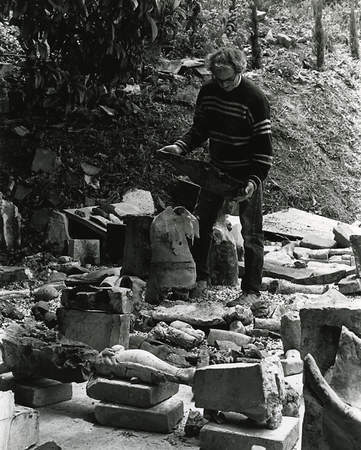 Having been incredibly productive the last 50 years, it was remarkable that Stephen remembered where individual elements were and what they were once part of, regardless of how abstract the object became, changed by breakage or time. Stephen’s last assemblage pieces (2006–2011) cannot be discussed without mentioning Derek Weisberg, a gifted and sensitive artist who worked as Stephen’s assistant in his last years. Stephen would say to Derek, “I know there is a brown foot located in that upper quadrant of the boneyard, could you please dig it up?” It may have been several days of digging for Derek, but sure enough, there it was! I have referred to the boneyard as a sublimation field—a multilayered repository of incomplete figures where psychological associations and their physical counterparts, in the form of fragments, compose a self-generated library from which Stephen drew. A bit like the realm of dreams, where time and association are held in an immeasurable dimension of one’s own making—uniquely accessible, and when drawn from, pulled into present time. All of the clay fragments carried historical information. 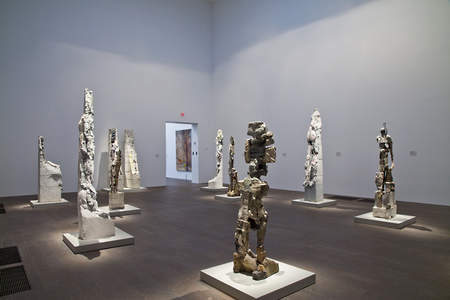 Some were quite neutral, others felt “charged,” almost as if arrested from a greater momentum that existed in a prior relationship, which, of course, they had in their original sculptural context. Yet something of that original dynamic became active within the contemporary assemblage work, though newly reconfigured. In so doing, Stephen created a rich dimension not previously intended, worked with, or seen in the early clay sculptures. The visual and sensual quality of the assemblage works is heightened by the sheer variety of the fragments found in any one sculpture. A new work from this series contains many different types of clay fired each at different temperatures, which results in a rich multitude of relationships within one sculpture. For example, one may find evidence of a porous tufflike clay structure next to a fatty, over-fired, porcelain one. What I find fascinating is how the work finds a center of gravity or grounding within itself while having been formed from such a multitudinous context. This is of course due to the sustaining vision of the artist! The Thorax Figure, which can be seen in the exhibition, is an incredible example of this—a tour de force, both technically and otherwise. LD: Some of these late assemblage pieces are on display in our exhibition. Others live on the edges of the boneyard. What do you think about these two different contexts for Stephen’s work: the clandestine nature of the studio versus the public display of the museum? DM: Each setting offers distinctive features and possibilities. To see work in the studio is to see it closer to the person who has made it. 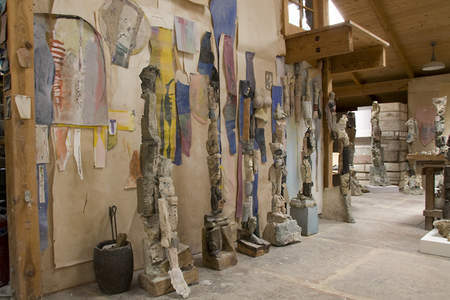 The studio is a visual collage, rich with information, and the work is still contextual to the artist’s methods and raw materials. One also can see the intimate collections of acquired curios; be it drawings, photos, studies, maquettes, discards, beloved and worn tools, et cetera—the detritus and treasures of exploration. The monograph that accompanies the exhibition was exquisitely conceived by the Museums’ Ednah Root Curator in Charge of American Art, Timothy Anglin Burgard, offering an extraordinary view into Stephen’s working environment. In addition to the elegant design, the insightful text is paired with images of the work and the artist. The book brings the beauty of the working environment into the museum in a rich and satisfying way. I am so glad that the last year of Stephen’s life was spent working with Tim and the staff of the Fine Arts Museums of San Francisco, all of whom he felt gratitude and respect for. To return to viewing the work in a public setting, a museum space provides visual clarity particular to a curatorial intention. The personality of the artist is not as present, and in that neutral setting, the viewer has an opportunity and freedom to meet the work with their own resonating questions and individual interpretations. LD: Something that has always appealed to me in your writing and in your correspondence about Stephen’s work is your intimacy with the process and the spirit of the art-making endeavor. I imagine that this understanding of Stephen’s work is a two-fold manifestation: of your partnership with him, and of your own work as an artist. What can you say about the artistic partnership? DM: We were very fortunate in our creative partnership. It quickly became apparent that we were capable of connecting to the singular intimacy we each found necessary to maintain with our individual work, while remaining deeply connected in a loving place with one another. At the end of any given day, there was the actual work that remained as evidence of the greater endeavor, yet our creative alliance was more within the unseen, the imminent events of our own process of discovery mirrored in a mutual exchange. The third body, the “Us,” was the center where all similarities and differences creatively met. LD: What was it like to work alongside Stephen De Staebler? In black water. Then day. Some people pick up their tools. Others become the making itself. We shared the love of working, to be inside a process of discovery and event, each of our own making. To share life in this way is one of the most supreme of pleasures! LD: Stephen De Staebler’s works are, in his words, “metaphors for flesh and earth.” When I first saw your own recent artwork, I was immediately struck by how it also touches upon these metaphors; in particular, I am thinking of your pieces that resemble dried-up mud wallows. Tim Burgard, in his art-historical essay in our catalogue, writes about Stephen’s experiences in the mud wallows on his family’s farm as a child—in Stephen’s words, his “first true touch with clay.” What can you tell me about the mud wallow? 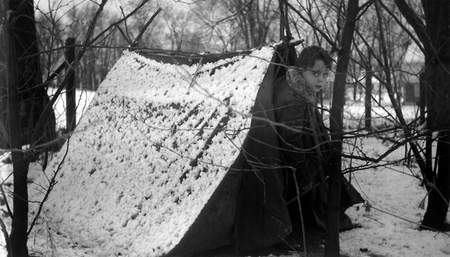 DM: An unfettered childhood spent in the openness of nature was a commonality we both shared. Stephen grew up in Missouri and Indiana and I was raised in western Pennsylvania. I don’t think it would be inaccurate to say that the deciduous forest was our first studio! These were not park settings, but open lands that extended mile upon mile. In hindsight, I came to understand that through interactive play with the primary elements of nature—soil, wood, water, air and fire—an idiosyncratic relationship was able to develop with the inherent processes of nature, in which human beings are but one integrated component. I think both Stephen and I transcribed those experiences with the use of clay, creating our own vocabulary for questioning, exploring and expressing issues that were important to us as artists. For Stephen, it was clay as body/earth, a searching and finding of the human figure in various states of physical and psychological momentum—returning to the earth or attempting to ascend with, or from, the earth. For me, working with the processes found in nature provides the call and response to my own ontological questioning. For example, in my series Alluvial Interiors, I attempt to draw attention to the greater water cycles of the earth, paralleled with the action of water within the human body. The intimate connection between both creates an ever-fluid living system of permeability in which water is constantly transpiring. One intention of my evaporation pools is to create an opportunity to witness this living process in the formalized setting of an interior space. Bringing the outside to the inside. Does this bring us back to Stephen’s wallow? That summer the river had flooded its banks and created a tremendous wallow. We’d go down there day after day and wallow around in the mud—that black, gunky stuff. You know, that was my best touch with clay. There is no way to describe how good it felt. And I’ll never forget my remorse when the sun began to dry it out; instead of mud, there was that shrunken, cracked shell over the wallow, and that was it. 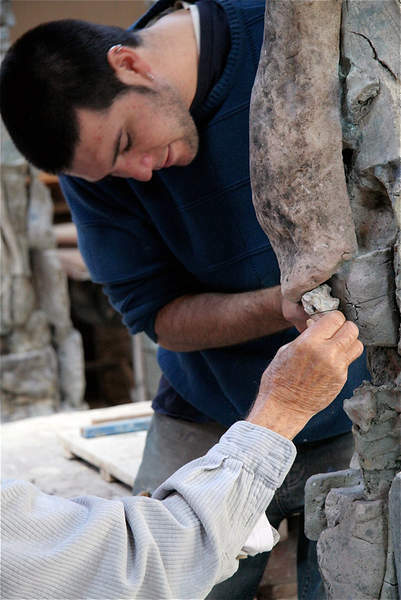 I think that was my first insight, unconsciously of course, into how time is inseparable from clay. Danae, I believe you had a similar childhood experience? DM: I remember how delighted Stephen was when I recalled this childhood memory: while standing waist high in the warm, gentle, summer water, well below the udders and legs of creek-side cows, pulling clay from the towering stream bank, shaping it, setting it adrift, watching the shapes I made sink to the bottom, while streams of reddish-brown ribbons fled in the current. LD: Stephen De Staebler’s sculptures are yearning and declarative forms; they struggle to express themselves as much as they seem to writhe in the intricacy of that struggle. I think many viewers who have encountered his work have felt this powerful and seemingly ineffable quality. 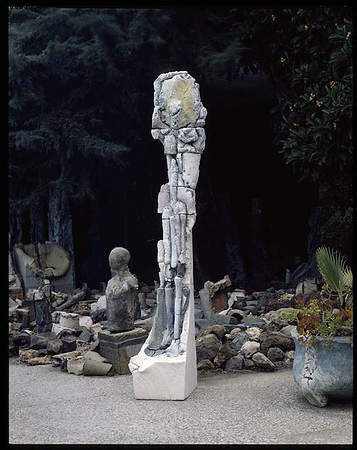 Like the many fragments that compose the wholes of his later sculptures, perhaps the most cohesive explanation of his work is the composite of different interpretations made by those who engage with it, as you mentioned earlier. Do you think Stephen would have agreed with this? DM: Yes, I do. Stephen greatly honored the individual relationship of the viewer to his work. In some ways the ultimate respect was given to the observer—make of this what you will. So much so that in public lectures Stephen most often answered a question with a question, or channeled a thought into a greater historical or philosophical direction. By doing this he was not being evasive, but rather opening doors for independent discovery, including his own. As you said so beautifully, coming into relationship with the ineffable. LD: With this in mind, how would you describe Stephen De Staebler’s work? DM: That is a question with numerous subjective answers! What first comes to mind though is self-recognition. Stephen’s work invites self-reflection on the deeper levels, prompting a poetic form of self-recognition. At any one moment in time perception of one’s self is unavoidably integrated with prior experience, consciously and subconsciously. And yet what presents itself temporally is only a fragment of that greater whole. There is a coexisting of unity within fragmentation together with the sense of fragmentation within unity—both individually and collectively. How the human spirit sustains and expresses itself within that dynamic is profound . . . mystery with an open invitation! Stephen’s work has always been for me a powerful expression of this and I believe that the work successfully speaks about the complexity of the human condition. LD: And to close our conversation, how would you describe Stephen De Staebler? DM: Stephen was a beautiful and brilliant human being who embraced life with a loving, if not yearning, heart. He was unassuming and kind. 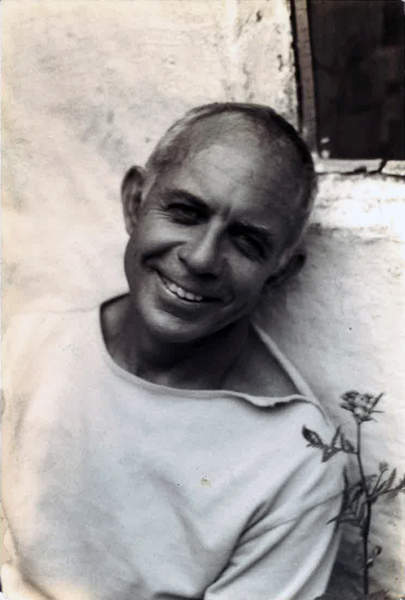 When you combine those sensitive qualities with such a prolific studio practice, a practice driven by his tenacious questioning of the spirit/body/earth relationship, you find a remarkable person. Danae Mattes is an artist who lives and works in Berkeley, California. Her artwork can be found at www.danaemattes.net. 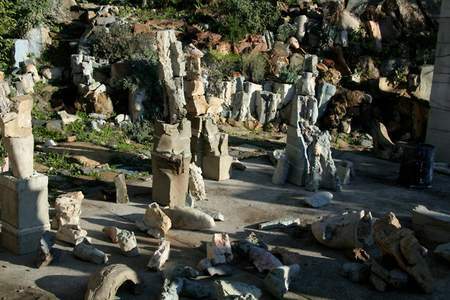 Matter + Spirit: The Sculpture of Stephen de Staebler will be on display through May 13, 2012 at the de Young.